If you wish to find lyrics next to the music videos you view on YouTube, LyricsPlug might seem like one amazing program. Once you click the download button presented on lyricsplug.co and install the suspicious application onto Firefox, Chrome or Internet Explorer browsers the plugin installs cookies as well. These can help the program determine what pages you visit so that lyrics could be presented. Are you now viewing an official music video and no lyrics are presented? Well, this is not surprising because the plugin is not reliable at all. Actually, it is much more believable that the cookies connected to the plugin are meant to aid third party affiliates who may manage different advertising networks, like ads.panoramtech.net. Advertisements supported through such advertising domains are unreliable and should not be trusted, which is why LyricsPlug removal might be something you need to perform as well. Once you click the download button on the official page you are presented with a dialog box asking you if you wish to Run lyricsplug.exe from shorlakmedia.com. If more than one of the aforementioned browsers exist on your computer we can assure you that the plugin will be installed on all of them. Once this is done you might discover that the application has been published by an unverified publisher. If you are running Chrome you can check the Permissions link to discover how LyricsPlug can act. Our researchers have discovered that the program can access data on the websites you visit as well as to record browsing activity. 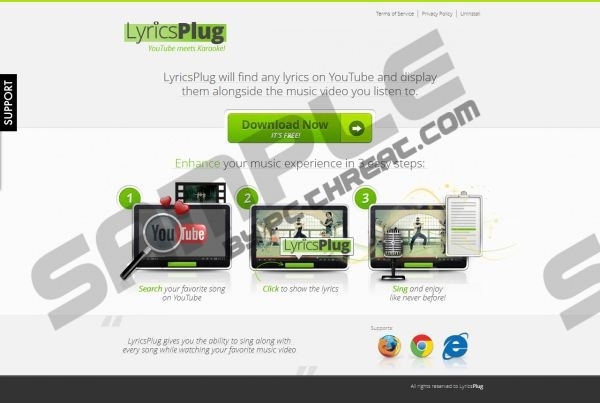 The same activity can be performed by LyricsKid, Bestlyrics, LyricsBuddy, LyricsPal and tens of other similar applications. It is recommended that you delete these applications if they are running because they are affiliated to third parties as well, and so the represented pop-ups could lead you to various dubious websites. As research has revealed, LyricsBuddy could potentially travel bundled with adware. This and the fact that the program is supported by unknown third parties lead us to believe that you should delete the plugin from the computer. We recommend using automatic malware detection and removal software to delete LyricsBuddy from the system. Click the download button to acquire the tool which will remove the plugin and the potentially running adware. Note that if adware truly exists it will not be enough to perform the manual removal instructions presented below. Open the Start menu. The icon is located on the Task Bar. Click Control Panel to find Windows utilities and go to Add or Remove Programs. Move to the Task Bar, click the Start icon and select Control Panel. Go to Uninstall a program and locate the program you wish to delete. Right-click it and select Uninstall. Access the Metro UI start menu and right-click on the background. Select All apps and go to the Control Panel. Click Uninstall a program and right-click the program you wish to delete. Select Uninstall to compete the removal process. Quick & tested solution for LyricsPlug removal.